In 2000, the University of Southern California’s architecture school began work to restore the Freeman House, a 1924 Frank Lloyd Wright house perched on a hillside in Hollywood that had been heavily damaged by the 1994 Northridge earthquake. Many of the home’s signature textile blocks were carefully removed, dutifully inventoried in a 1,000-page report, and placed in a South LA storage room inside a former power plant. Several pieces of custom furniture designed especially for the house by Wright as well as Rudolph Schindler were also stored in the room. Somehow, at least three of those furniture pieces went missing and their theft went unreported for more than six years, as the Los Angeles Times reported last week, amplifying concerns raised by architects and preservationists that the school—which also operates Pasadena’s iconic Gamble House—is mismanaging two of LA’s most innovative homes. 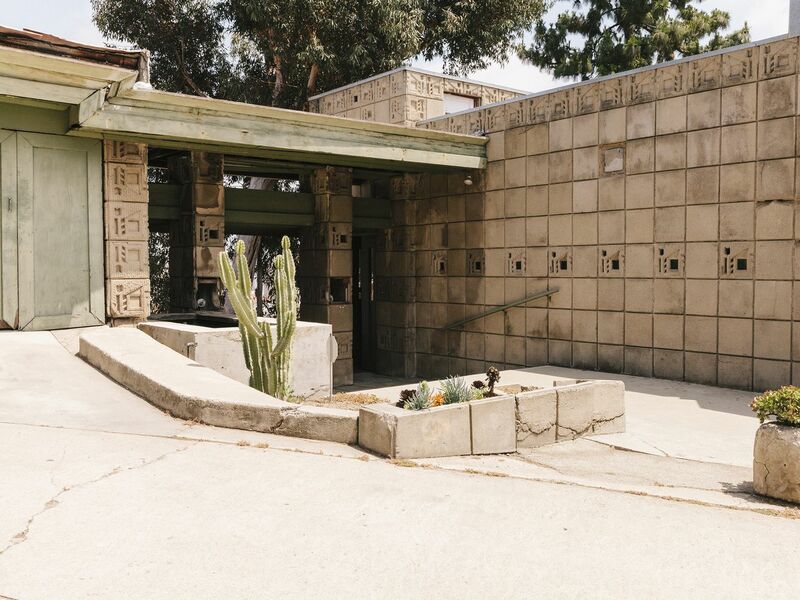 Los Angeles is home to some of the world’s legendary experimental residential architecture, but very few of these important houses are open to the public. USC has a remarkable opportunity to ensure these prized cultural assets remain intact and accessible to the community, preservationists say. An interior photo of the Freeman House in 1953, including furniture designed by Schindler. 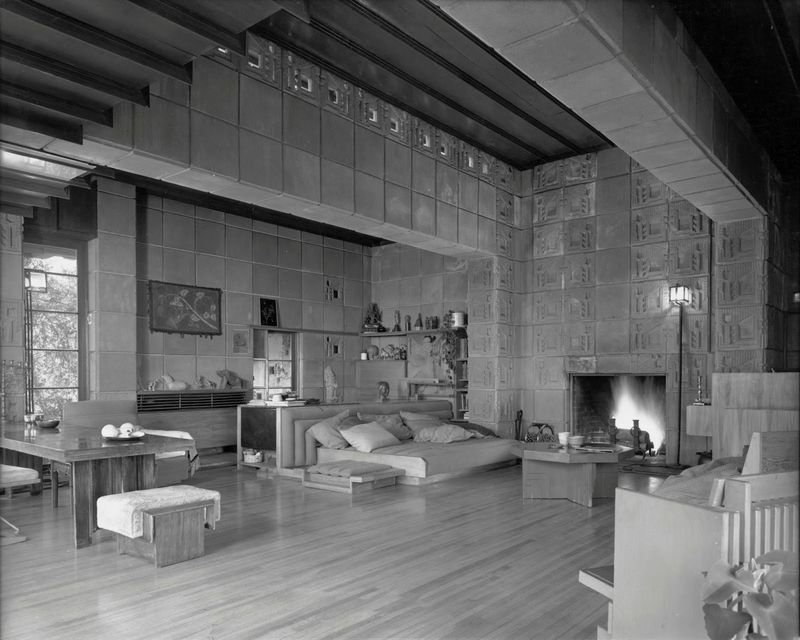 The floor lamp designed by Wright to the right of the fireplace is one of the items reported stolen from USC’s warehouse. Since 1986, USC has owned the Freeman House, one of only four textile-block homes designed by Wright that used patterned cast-concrete as a building material. (Wright’s three other textile-block homes are privately owned.) In addition to as-yet-unfinished repairs following the earthquake 25 years ago, the residence is still without a full-time director after more than 30 years in USC’s possession. And despite decades of promises, the property has never been opened to the public. In a statement to Curbed, USC called the Freeman House an “important architectural asset” and notes that the school is “providing regular maintenance and onsite monitoring of the property” while fundraising for future repairs. The university also operates the Gamble House in Pasadena, a 1909 Craftsman bungalow by Greene and Greene that is widely considered one of the foremost architect-designed houses in America. In August 2018, the Gamble House’s longtime director Ted Bosley resigned, citing “differences of approach between himself and USC School of Architecture leaders over the future of the Craftsman icon.” A USC spokesperson says “nothing has changed in terms of day-to-day operations” at the Gamble House since curator Jennifer Trotoux took over as interim director in January. Unlike the Gamble House, which was opened for tours in 1966, USC’s stewardship of the Freeman House has oscillated between surges of attention and periods of neglect. In the years during the restoration work, designer Tim Champ lived one house over in the Schindler-designed DeKeyser House. By 2000, much of the furniture had been moved to the storage room, and by 2004, USC graduate students were occupying the home as caretakers. In 2012, according to the Los Angeles Times, a facilities staffer reported that several Freeman House items were missing from USC’s storage room. The thefts were not made public until last week, when the paper published its story, based on an anonymous tip that triggered an internal USC investigation, and eventually a police report. A former USC associate with knowledge of the storage room’s contents who asked to remain anonymous tells Curbed that the theft was well-known to people at the school at the time, and that no photos have been shared because the school does not know exactly how many pieces have disappeared. In addition, at least two textile blocks were known to have been taken from the house as the Freeman House sat empty, including two blocks prominently absent from the home’s entrance that can be seen in current photos. A Freeman House textile block that was put up at auction at the Chicago-based Wright auction house, where it sold in June for $5,000, motivated the anonymous tipster to alert the Los Angeles Times about the 2012 furniture theft—and the lack of response from USC about the missing pieces. The Chicago collector who consigned the block with Wright tells Curbed they bought the textile block in an eBay auction on May 12, 2012 . That listing is no longer online, but the collector remembers the seller saying the textile block was taken during a time that renovations were being made to the Freeman House garage—and there was a “free for all” for “several” blocks stacked on the sidewalk. The collector decided to stop collecting Frank Lloyd Wright works last year and approached the Wright auction house about selling the block. In 2016, Wright sold a Frank Lloyd Wright floor lamp for $100,000 which was reportedly nearly identical to the two missing Freeman House lamps. The lamp Richard Wright sold came from the Storer House in Hollywood, another textile-block house from the same period, which had been bought and sold by film director Joel Silver. Wright confirms Silver as the seller of the lamp. Although there are online forums to report and track stolen art pieces, the provenance of design and decorative artifacts is left largely up to sellers and collectors to provide. In this case, not only the police, but various Frank Lloyd Wright associations should have been alerted about all the losses immediately, says Wright. USC shares management duties of the Gamble House with of the city of Pasadena, which has owned the home since it was gifted by the Gamble family in 1966. The way the thefts remained unreported by USC leadership is only one concern that has surfaced about the way the architecture school is overseeing its showpiece homes. Bosley’s departure from the Gamble House after 28 years has left an uncertain relationship between the school and the city of Pasadena, which owns the home. Only the second director of the home since it was opened to the public in 1966, Bosley was a well-respected leader and a fundraising juggernaut who raised millions of dollars for critical repairs. The timing of his departure has even led some to publicly muse if Bosley had dispatched the whistleblowing email to the Los Angeles Times. Bosley confirms to Curbed that he did not. A USC employee who is not authorized to speak on behalf of the architecture school noted that Bosley’s vision for the house was at odds with the vision of Milton S. F. Curry, who was named dean in 2017. Curry has reoriented the school around a “citizen architect” mission focused more on community and social issues, explains the employee, which may not prioritize the operations of historic properties. “The last two deans haven’t had that mindset, and it shows,” says Elizabeth Timme, co-principal of LA-Más, and daughter of Robert Timme, the USC architecture school dean who raised $1.3 million for the Freeman House’s restoration in the 1990s. “These properties are an extension of the school and it’s the dean’s job to lobby for more resources to take care of them,” she says. Her father, whose legacy had become intertwined with the home by the time he died in 2005, had even floated an idea to sell the house as a means to that goal, as evidenced in a 1998 letter to the Los Angeles Times. USC’s School of Architecture has since made a deal to acquire a third historic home, a modern masterpiece beneath the arches of the Colorado Street Bridge in Pasadena. Reached by phone, Carol Soucek King tells Curbed she had learned of the Freeman House thefts from the Los Angeles Times story last week. “It sounded like a discussion I might be concerned with,” she says. But she noted that she had taken measures to avoid similar issues. Photo by Felís Stella. Copyright © 2019 Felís Stella. All rights reserved. Carol Soucek King’s Buff & Hensmen house sits in the shadow of a historic Pasadena bridge. The Freemans left $200,000 for maintenance when the house transferred ownership to the school in 1986. Contrast that figure with a “bare bones” rehabilitation estimate provided to Curbed by USC’s historic conservation specialist, Trudi Sandmeier, in 2017: at least $2.5 million. In comparison, a single capital campaign for the Gamble House completed in 2004 raised more than $3.6 million. The Gamble House also has a partnership with the Huntington Library to display artifacts, and a secured, climate-controlled storage facility. Like King, who also hosts salons in her home, the Freemans’ wish for their home was to be used the same way they used it—as a cultural space for the community, not necessarily as a museum. AIA Pasadena and Foothill executive director Zelda Wong has seen the homes’ benefits to the school first-hand, both while working at USC for seven years and as a docent at the Gamble House. “It is a good tool for learning, it’s a laboratory for students,” she says.